There was three electors for the Eastern Shore. 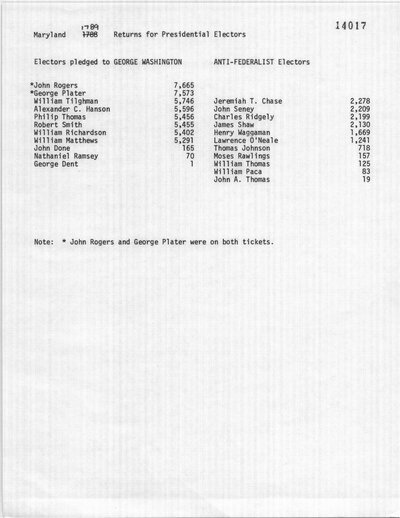 According to Presidential Elections in Maryland, William Tilghman received 5737 votes and William Matthews received 5442 votes. William Tilghman and William Matthews voted for George Washington and Robert H. Harrison in the Electoral College. William Richardson was present but did not vote. Presidential Elections in Maryland lists William Tlighman with 254 votes. Presidential Elections in Maryland lists William Tlighman with 18 votes. 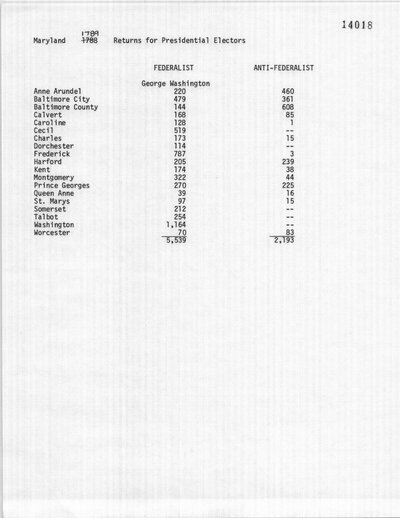 Presidential Elections in Maryland lists William Matthews with 153 votes. Presidential Elections in Maryland lists William Tlighman with 320 votes. Original Election Certificate. Maryland State Archives, Annapolis. The Maryland Gazette (Annapolis, MD). January 22, 1789. DenBoer, Gordon and Lucy Trumbull Brown, ed. The Documentary History of the First Federal Elections: 1788-1790. Vol. II. Madison, WI: University of Wisconsin Press, 1976. 205. Scharf, J. Thomas. History of Maryland from the Earliest Period to the Present Day. Vol. II. Baltimore: J.B. Piet, 1879. 549. Willis, John T. Presidential Elections in Maryland. Mt. Airy, MD: Lomond Publications, 1984. 155.